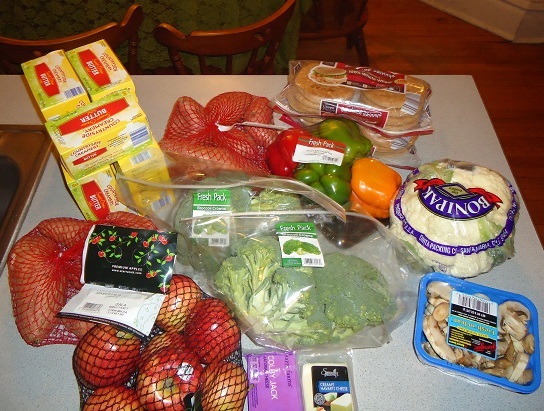 Menu Plan for the Week With Four Different Shopping Trips – Phew! I think I was out of town more than I was home this week. Between basketball games and appointments, I traveled 5 out of the last 8 days. I am a wee bit tired. Thankfully, we were still able to eat fairly well thanks to how easy it is to grab and pack fruits and vegetables for the road. 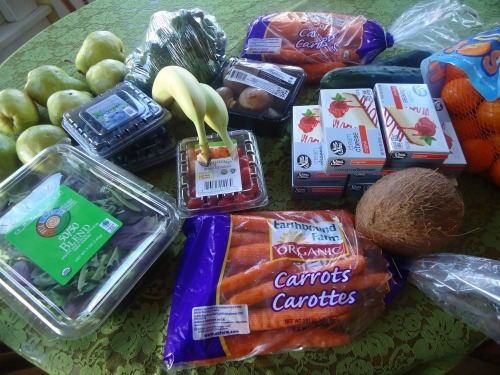 Here’s a little grocery run-down of my week. And by the way, we also eat meat, grains, and dairy – I just get them from our food co-op or local sources in bulk, so rarely take pictures of those. Next time I get a big meat order, I’ll snap a shot of all the frozen packages, since I know you’re dying to see them. On Monday, we were out of almost all fresh fruits and veggies. I went to our local grocery store, which is just a few blocks away. I took advantage of their sale price on cream cheese (Pumpkin Cheesecake, here I come), plus picked up some fresh produce to get us through for a few days. I found a fun deal while I was there which gave me a FREE bag of clementines with my $25 purchase. Sweet!!! On Wednesday, the boys and I were in Lincoln for appointments. This also happened to be the grand opening day of a new Aldi store a few blocks from our appointments. All five of us walked the very busy aisles grabbing butter for only $1.89/pound, sweet potatoes for 33¢/pound, and many more goodies for very low prices. What a fun shopping trip! I won’t be able to go to Aldi often, but I will continue to use their prices on produce for price matching at our local Walmart. 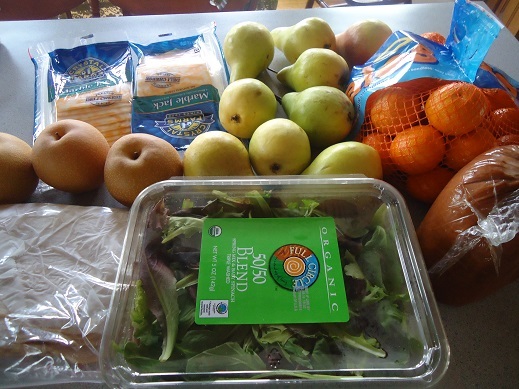 By Friday, we were already out of mixed greens, pears, clementines, raspberries, blueberries, and blackberries. 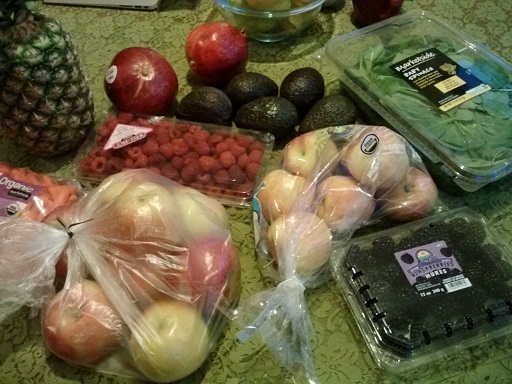 I decided to run to our local store for deli meat and cheese for our basketball travels, so picked up more fruit and greens while I was there. Now here’s hoping I can stay out of the store for several days and instead work with all the deliciousness we have on hand. Hope you don’t get tired of my grocery store pictures. You like looking at pictures of food, right?! Don’t miss the BOGO Coconut Oil with Free Shipping this weekend! I love your grocery pics! Our also has an organic line and a gluten free line available which is awesome since I have to be gluten free. I was so excited when I found they have organic virgin coconut oil for only 2.49 a pint! And raw organic cheddar for 3.00 for 8 oz. Its not always available so I stock up. And have organic produce as well. Thank you Laura I appreciate you. Wow! The coconut oil is 4.99 at my store! Be sure to poke holes in the “eyes” of the coconut and get all the lovely coconut milk out before you crack open the whole coconut!!!! Enjoy!!!! Love it! What a blessing to have all those growing young men ???? Do I see that you don’t buy everything organic? Your butter and cheese are not. I struggle because as much as I have changed our lifestyle, make so much on my own, and buy so much organic, I cannot afford for the butter to be. With the amount we consume in a week, my husband would need a second job! :) Your ministry continues to be a blessing. Thank you! Thank you!! A breath of fresh air and something I needed to hear. I have stopped reading so many blogs because it has made me feel if I don’t buy everything organic or make everything myself…I’m a failure. My goal now: to put nourishing food on the table for my family. By the way, I love your blog! Many blessings to you and your family in 2015! !